Command Sergeant Major Sekelsky enlisted in the Army in 1978 and completed the Special Forces Medical Sergeant Course. He was initially assigned to 7th Special Forces Group (Airborne). At the conclusion of his initial enlistment, he joined the Army Reserve’s 11th Special Forces Group (Airborne), based in Tappan, NY. In 1983, the Bridgeport, CT native returned to active duty and was reassigned to 7th SFG (A) before his selection to join the newly-reactivated 1st Special Forces Group (Airborne) in 1984 where he served until 1988. Following German language training at the Defense Language Institute/Foreign Language Center(DLI/FLC) in Monterey, CA, Command Sergeant Major Sekelsky was assigned to the Physical Security Support Element in West Berlin, Federal Republic Germany. Following his Berlin assignment, he joined the 10th Special Forces Group (Airborne) at Fort Devens, MA, where he served as Detachment Medic, Team Sergeant and First Sergeant. After promotion to Sergeant Major in 1998, and completing the Sergeant Major Academy, he served as Company Sergeant Major on Co. A, 2nd Battalion, 10th SFG (A). Continuing his service with 10th SFG (A), in 2001 Command Sergeant Major Sekelsky was reassigned to Co. A, 1st Battalion based at Panzer Kaserne, Germany. In 2003, he was assigned as Battalion Sergeant Major of 1st Battalion, 7th SFG (A). Command Sergeant Major Sekelsky returned to 10th SFG (A) in 2004 as the 3rd Battalion Sergeant Major and in 2006 he became the 25th Command Sergeant Major of the Army’s original Special Forces Group. In May 2009, Command Sergeant Major Sekelsky was selected as the Command Sergeant Major of the United States Army John F. Kennedy Special Warfare Center and School. In 2010 Command Sergeant Major Sekelsky was selected as the Senior Enlisted Leader to Special Operations Command Europe. October of 2013 he conducted his Change of Responsibility. He will be retired 31 MAR 14 with over 34 years in SOF. Command Sergeant Major Sekelsky is a graduate of the Special Forces Combat Diver Course, Dive Medical Technician Course, Dive Supervisor Course, Military Freefall Course, Jumpmaster Course, German Language Course at DLI/FLC and the Advanced Special Operations Techniques Course. His operational assignments include Operation PROVIDE COMFORT in Iraq; Operation PROVIDE COMFORT II in Turkey and Iraq; Intelligence Assistance at the U.S. Embassy in Bucharest, Romania; two tours in Bosnia-Herzegovina; Operation JOINT GUARD in Kosovo; two Noncombatant Evacuation Operations in Ivory Coast and Liberia; four tours in support of Operations IRAQI FREEDOM. 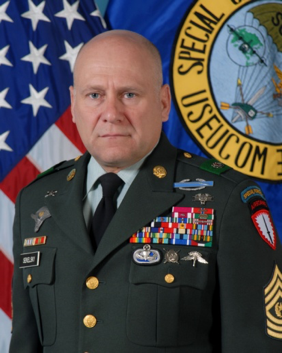 His awards and decorations include the Defense Superior Service Medal, Legion of Merit, Bronze Star Medal, Defense Meritorious Service Medal, Meritorious Service Medal, Army Commendation Medal, Combat Infantryman Badge, Expert Field Medical Badge, Jumpmaster Badge and Dive Supervisor Badge. Command Sergeant Major Sekelsky married his beautiful wife Mary over 32 years ago. They are blessed with five children; Amy, Chaz, Sean, Travis, and Jamie; and 4 grandchildren Madelyn, Jameson, Koen, Brayden, and Meira.